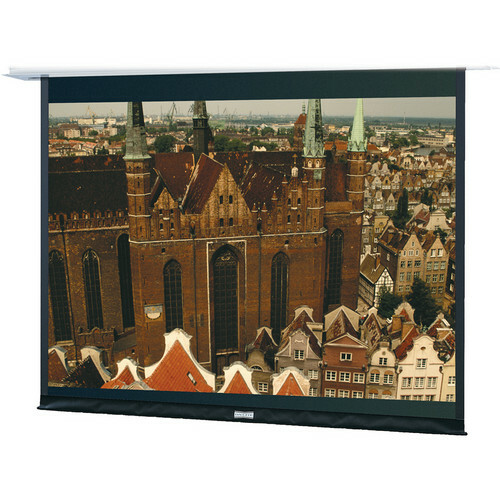 The Dalite 146 x 260" Large Advantage Electrol Projection Screen is a unique design. Construction of this ceiling recessed screen permits the case to be installed first and the fabric added later once a suitable projection surface is decided on. This is a big "plus" since companies constructing viewing rooms may not be certain of what they need in a screen. However, the Advantage permits the basic frame to be installed in the ceiling - ready for a finished fabric assembly to be added when all is prepped. It is designed for larger projection venues such as auditoriums, theaters and lecture halls. Unlike similar screens of its size, the Large Deluxe Advantage Electrol features one-piece construction. Note: This item contains the fabric ONLY - screen box sold separately. The Deluxe model has a motorized door into which the screen retracts. The non-Deluxe Advantage model has a 2" slot on the bottom where the fabric drops out. This item contains the fabric ONLY - screen box sold separately. Box Dimensions (LxWxH) 294.0 x 15.0 x 12.0"